According to statistics from the Governor’s Office of Highway Safety, Gwinnett County consistently ranks among the most dangerous counties for traffic fatalities. If you have been seriously injured or a loved one has been killed in an accident in the greater Atlanta area, McGarity and Efstration is prepared to help. Our experienced attorneys are committed to protecting your rights as we work to obtain the maximum amount of compensation possible. Our highly-qualified and knowledgeable trial lawyers work closely with you throughout the legal process, so you know where your case stands at all times and can make the best decisions for your future and your family. File a claim with your own insurance company — Under ideal circumstances, your company would pay your claim, then seek reimbursement from the at-fault driver. But more often than not, this option puts you in an adversarial role with your own insurer. Your insurer may even attempt to show you were also at-fault as a way of reducing the amount it has to pay to you. The possible conflicts of interest are even worse if the company insures both you and the at-fault driver. Moreover, a serious accident can easily exceed your policy limits, forcing you to sue the at-fault driver anyway. File a third-party claim with the at-fault driver’s insurance company — This puts you in an adversarial relationship with the insurance company, which will use all the tactics at its disposal to reduce the amount it pays on your claim. Your losses may exceed the limits of the other driver’s policy, forcing you to file a claim under your own policy’s underinsured coverage (if you even have such coverage), or to sue the other driver in court. Retain an attorney to pursue a claim against the at-fault driver — The only way to be certain that you have an advocate that’s 100 percent on your side is to hire your own lawyer to pursue compensation from all potential sources. Since we offer free consultations, you can discuss your options with one of our experienced attorneys at no cost to you. 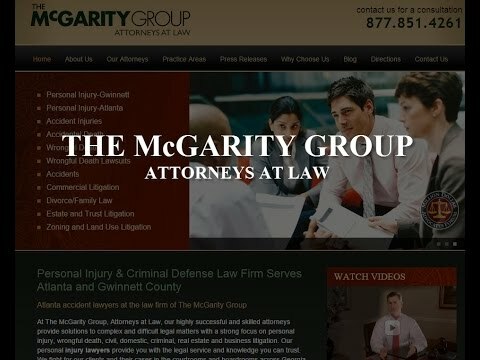 Georgia law only requires a minimum of $15,000 bodily injury liability coverage per injured person with a maximum of $30,000 per accident. The minimum state requirement for property damage liability coverage is only $10,000. These amounts are nowhere close to the losses you can expect from a serious auto accident. To recover full compensation for your injuries, you need a Buford personal injury lawyer who is dedicated to your case. Review your case — After receiving medical attention, hiring an experienced lawyer is the best decision you can make. A lawyer assesses your case and informs you about its strengths and weakness, then advises you on how to move forward. Hire expert witnesses — Doctors and investigators provide valuable testimony on your behalf. This evidence can significantly bolster the strength of your case and improve your chances of being justly reimbursed. As your counsel, we advance the costs on these services. Fight for you — When you hire a lawyer, you gain an ally to stand by your side and fight for you. We can negotiate a fair settlement or take your case to court. Provide personalized legal assistance — Few auto accident lawyers offer the personalized legal guidance McGarity and Efstration provides. We offer patience, support and knowledgeable guidance throughout every stage of your case. After an auto accident, trust our firm to provide you with the representation you need. Haggling with insurance companies on your own inevitably means settling for much less than your case is worth. McGarity and Efstration is determined to deliver the maximum recovery possible for you under the facts of your case. To speak without charge to an experienced accident lawyer, call our Buford or Braselton office today at 877.851.4261 or contact us online.